I'm just back from one of my favorite annual birding events, the Brookline Bird Club's August overnight deep-water pelagic, sold out per usual. Before sunrise on Saturday, August 20th, a boat full of excited participants boarded the Helen H in Hyannis, MA with Capt. Joe Huckemeyer at the helm. We set out for the canyons at the edge of the continental shelf some 100+ miles from the mainland under clear skies and light winds from the east. The seas were more comfortable than usual: calm inshore and a 2-3 foot chop on top of a hardly noticeable swell offshore. 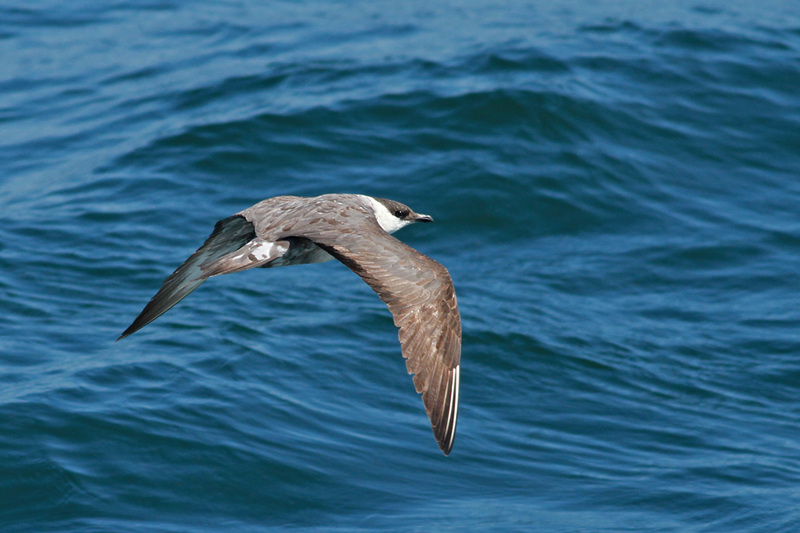 There was more than enough wind to get seabirds into the air, but not enough to make the ride uncomfortable. En route to the canyons we passed over the Nantucket Shoals, known for, among other things, intense upwelling of cold nutrient-rich water that can result in pockets of great fish and bird activity. The Shoals really delivered for us on Saturday morning. 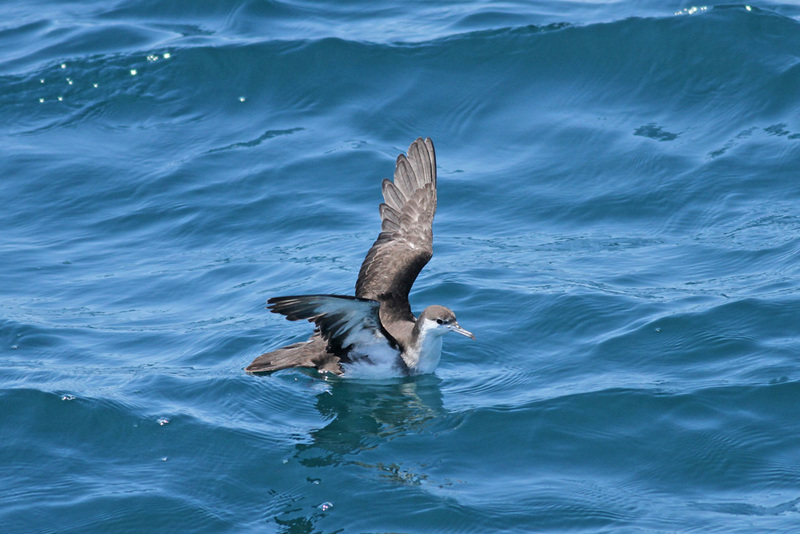 After a slow trickle of tubenoses along the northern shoals we eventually hit the motherlode of shearwaters, with no less than a thousand around us at one point. We had multiples of all four expected shearwaters: Cory's, Great, Sooty, and Manx. All three species of jaeger were observed with Long-tails making a particularly good showing. Both Red-necked and a few Red Phalaropes were cooperative. Terns were well-represented including loads of Roseates, a Black, and a Forster's. 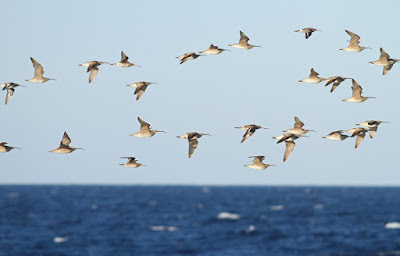 Those on board were not sure we remembered seeing the shoals quite so birdy and with such fantastic variety. 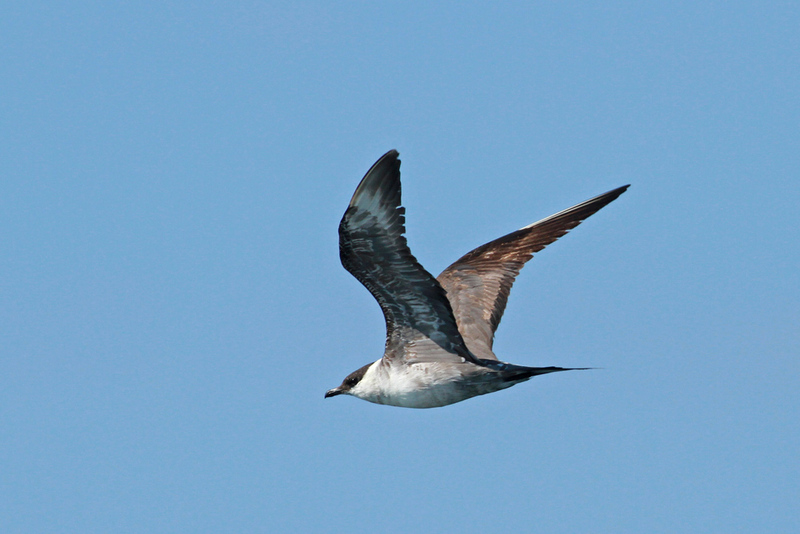 We pulled ourselves away from the "inshore" pelagics as we knew we had bigger fish to fry. We made our move through the relatively birdless shelf waters that lie between the shoals and the canyons. Before leaving the dock on Saturday morning we met with Capt. 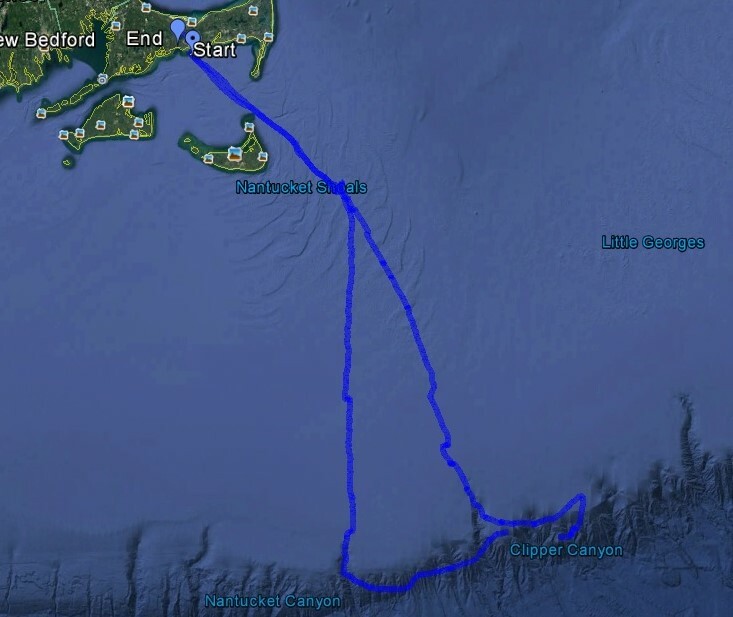 Joe and came up with a plan, based on sea surface temperatures from Thursday, to aim further east than our usual starting point of Hydrographer Canyon. The SST (Sea Surface Temp) maps on Thursday had shown that Hydro Canyon was full of cold water with no temperature break at all, and one of Joe's contacts confirmed that Hydro held cold, green water on Friday too. But as we were heading towards the canyons, Joe pointed out that the real-time SST data he was getting on board had shown a significant change - Hydrographer now held warmer water that had moved in from the east. So we changed back to our original [usual] plan of starting with Hydro. As we got into Hydro, the water did indeed warm up to 74-75 degrees and turn blueish. 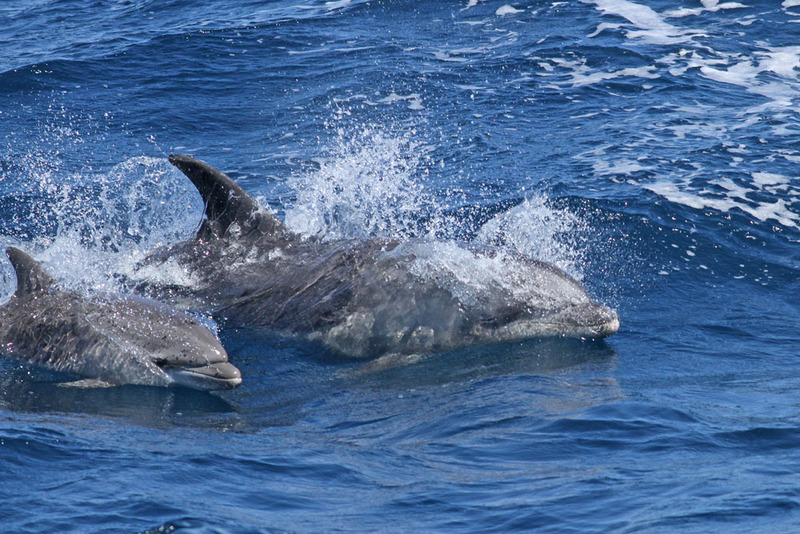 In this vicinity we had our first AUDUBON'S SHEARWATERS of the trip, and a pod of Offshore Bottlenose Dolphins decided to bow-ride for a few minutes. We worked southward through the canyon and turned east to slowly travel the shelf edge. The edge here held several hundred Wilson's Storm-Petrels plus a few Leach's and the first Band-rumped of the weekend. 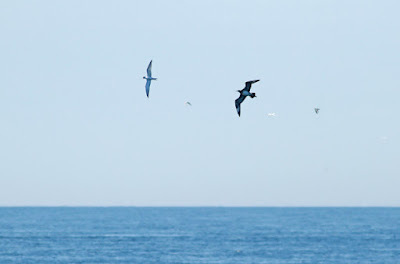 The wind increased to 10-15 knots, which gave plenty of carry to the scent of our chum slicks. The Wilson's were drawn like magnets to the chum, and each time we laid out a slick it didn't take long to accumulate dozens of them. 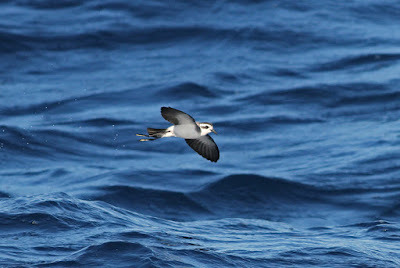 We were, of course, on high alert for the target bird of the trip: White-faced Storm-Petrel. With so many Wilson's around we figured it was only a matter of time...yet we couldn't pull one out. As we continued east, Joe mentioned that we would soon be getting into cold water. Welker and Oceanographer Canyons, which were warm just a day or two before, had been infiltrated with cooler water. We decided to continue east until we hit the cool stuff to see if there was any life at the temp break or beyond. The water temp soon dropped to 71-72, which is not necessarily a problem if the color/clarity is good. But its color turned an ugly green - not a shade usually associated with the edge of the continental shelf around here, and signifying that this was shelf water that was being pushed further south than usual. There was no life in the green water, and it quickly became apparent that continuing to the historically productive eastern canyons would not be our best move. Joe pulled up his SST map and suggested that we head back west into warm water again, but angle further offshore into even deeper water this time. Once we hit bluer and warmer water in late afternoon, we again found life. 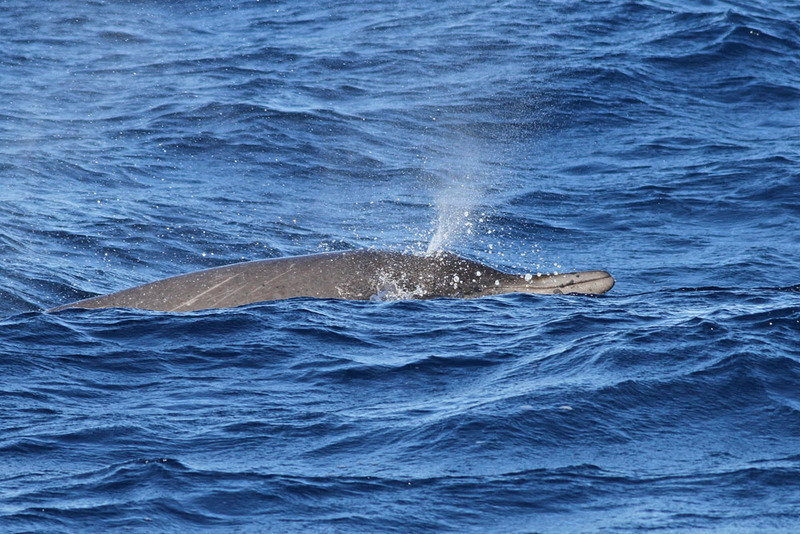 A distant pod of cetaceans was spotted breaching, which turned out to be beaked whales! 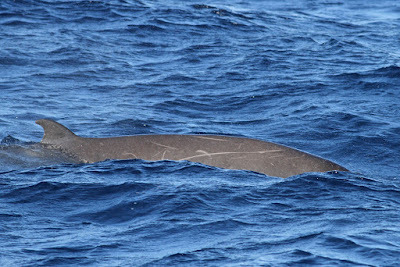 After some searching we were able to relocate the whales and get some really nice views and photos of the animals, a pod of Sowerby's Beaked Whales...a life mammal for most on board for sure (photos being sent to beaked whale experts to confirm ID). dozens more Wilson's Storm-Petrels and our focus shifted back to birds. It was time for more chum. A rather confused-looking Tree Swallow appeared alongside the boat and even hung around the slick for a while. Then, a flock of large shorebirds passed off the bow and we were treated to brief views of Whimbrel and Hudsonian Godwits on their long southward journey over the North Atlantic. 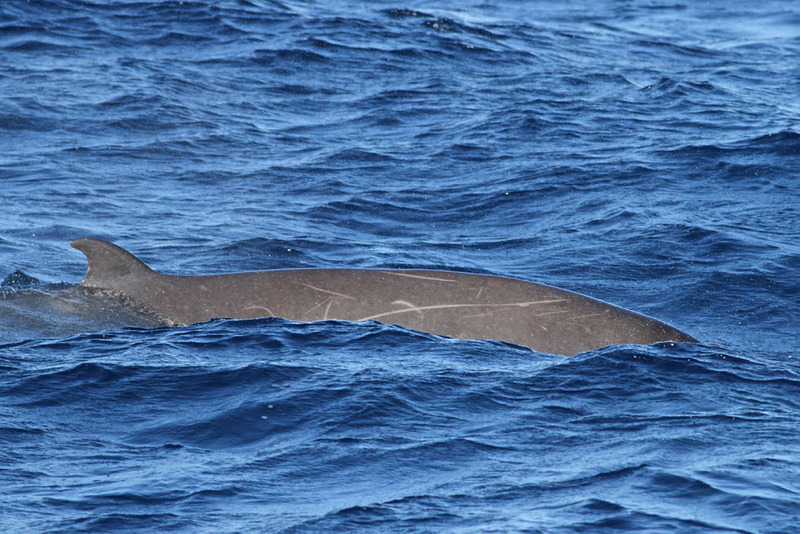 It's hard to believe some of the things you see in the middle of the ocean so far from land. 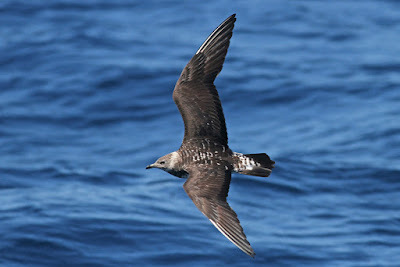 Finally, at 6:30pm, the shout of "WHITE-FACED" came from the stern. 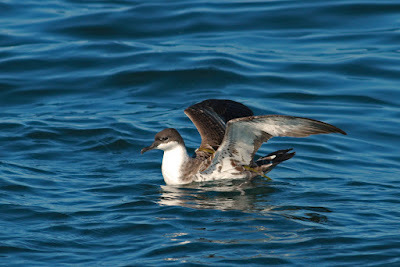 The bird was already close to the boat, seemingly appearing out of nowhere as is typical for them. Capt. Joe deftly maneuvered the boat in pursuit of the bird, and it was well-seen by all. 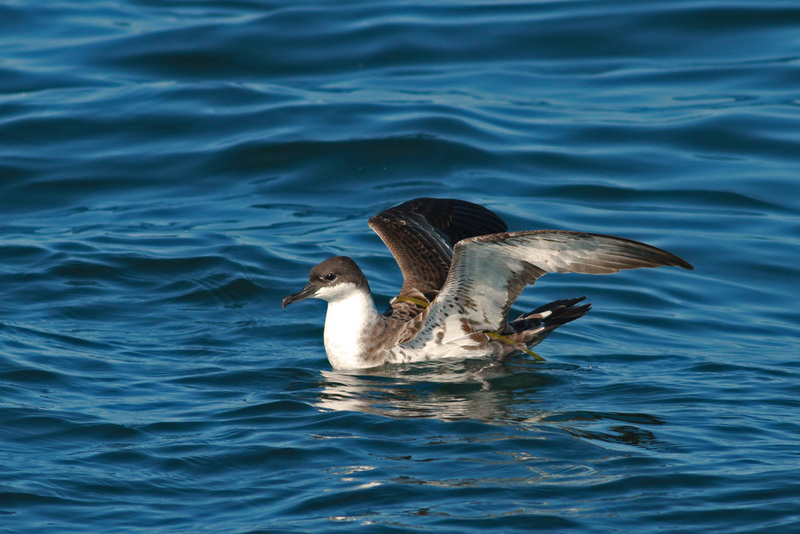 Joe knows the behavior of these birds so well that he nearly always gets us point-blank views of this species. With the first White-faced now in the bag, the leaders breathed a sigh of relief...but the birds kept on coming. With so much life around us, we decided to set up a chum slick here until dark. We had our only really nice views of Band-rumped Storm-Petrel at this spot. As the sun was about to set, Kate Sutherland spotted a BLACK-CAPPED PETREL that made a pass down the port side of the boat. Amazing. Unfortunately the bird was in harsh light and not super close, thus was not seen by many on board. We all enjoyed one of the most beautiful sunsets I can recall ever seeing on the water. But the action kept coming even after the sun went down. 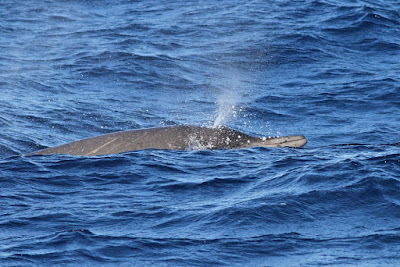 A massive WHALE SHARK approached the boat and put on a show for us, repeatedly coming right up to the starboard side. 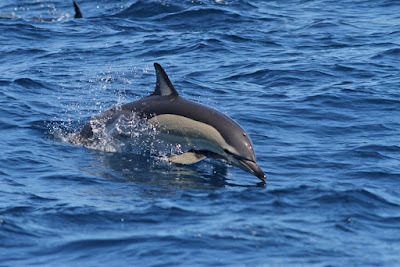 This was my third encounter with this species in these waters and each has been unforgettable. This one was particularly curious, almost playful. It seemed like it wanted to actually come on board to check us out. It was also larger than the others I had seen, this one probably somewhere in the 30-foot range. Can you see the outline of this beast of a fish underwater? Even in the dark we had a few surprises. 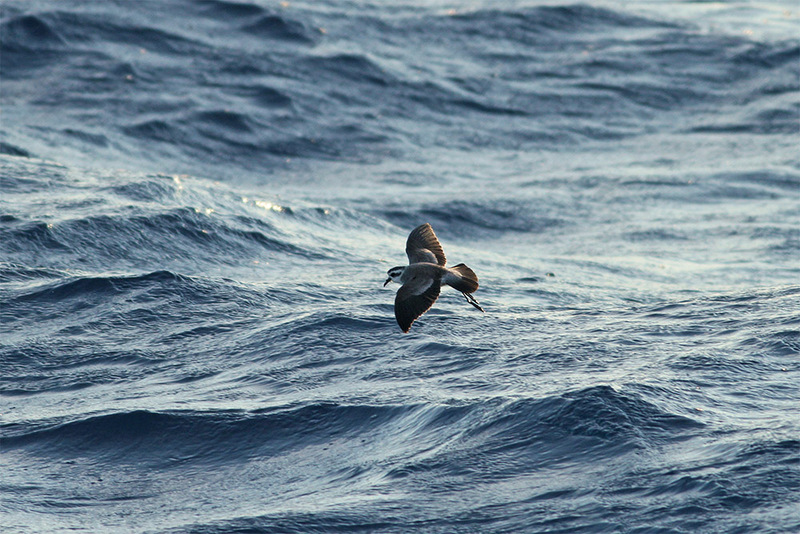 Several large squid were came to the surface, and a few were caught by the crew to use as fishing bait. We netted a few tiny juvenile Mahi Mahi to study briefly before returning these ridiculously fast-growing fish to the ocean. We picked up a chain of Salps to hold in our hands while participant Sea McKeon educated us on these fascinating tunicates. A Wilson's Storm-Petrel actually flew onto the boat, disoriented by the lights, and was soon safely released by Kate Shulgina. Eventually, though, everyone went to sleep, with smiles on their faces, I'd like to think...(except for the crew, which fished very unsuccessfully through the night!). The rise of a near-full moon soon after dark was a stunning way to end the day in a truly incredible place. 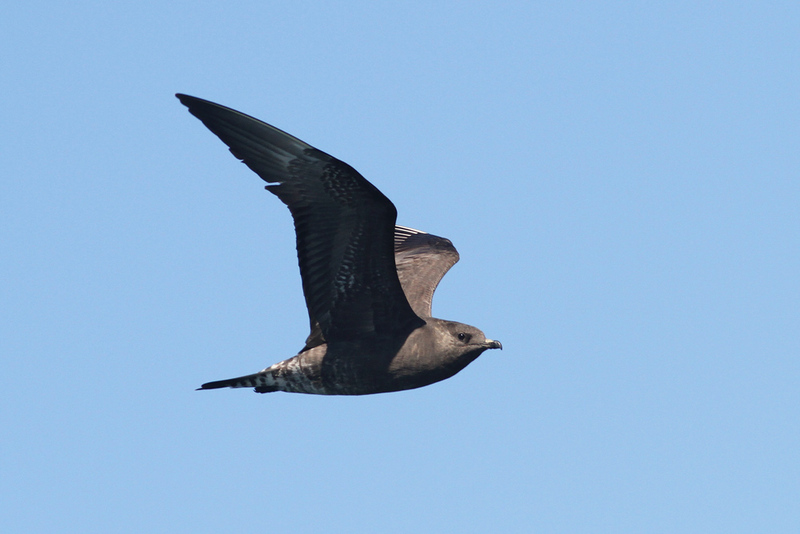 We awoke Sunday morning to more storm-petrels around the boat, thanks to the chum slick laid out all night by the fishing crew. We had drifted 10 miles WNW overnight, which put us barely back onto the shelf just east of Hydro Canyon. 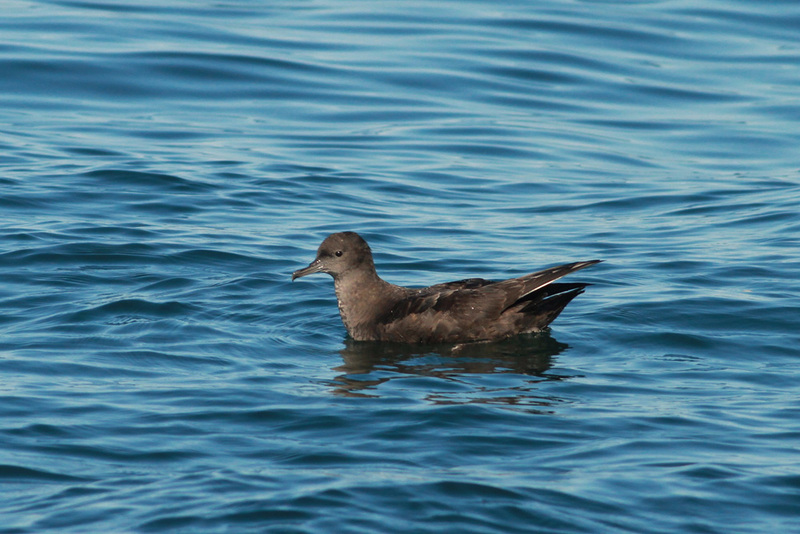 Other than a quick glimpse of another Band-rumped and a few Leach's, species diversity was low, so we moved on. Joe angled us a bit further offshore again before continuing along the shelf edge to the west. We were still in warm (~74-76 deg) blueish water, but not as pretty blue as we sometimes see. 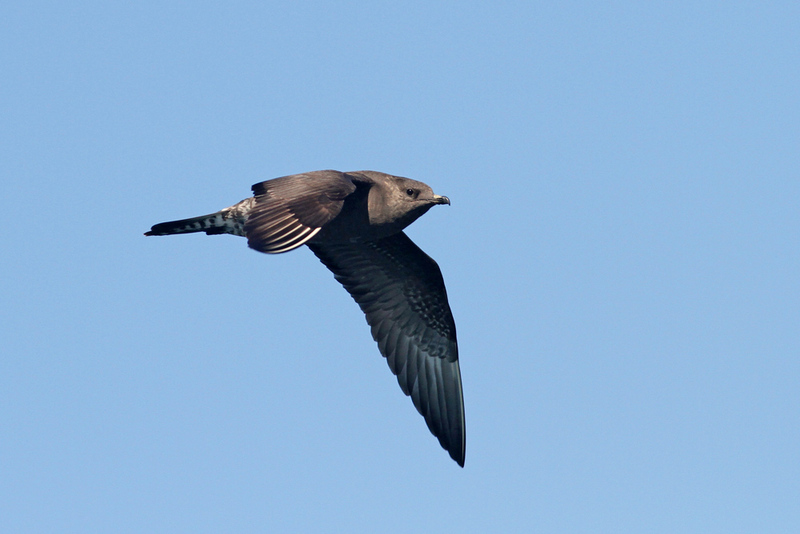 We were treated along this stretch to a few more WHITE-FACED STORM-PETRELS doing their pogo stick thing in pretty morning light. 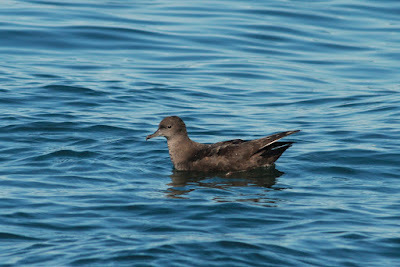 One bird was even spotted on the water next to a raft of Wilson's, which is rarely how we find them. Later in the morning we turned north, starting our ride home by passing through Veatch Canyon. 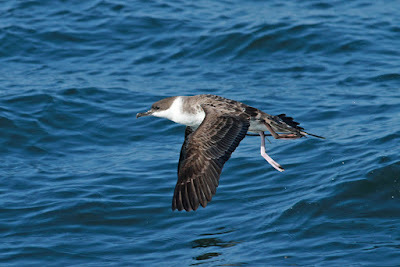 Here we encountered another Audubon's Shearwater or two and a cooperative pod of Common Dolphins. 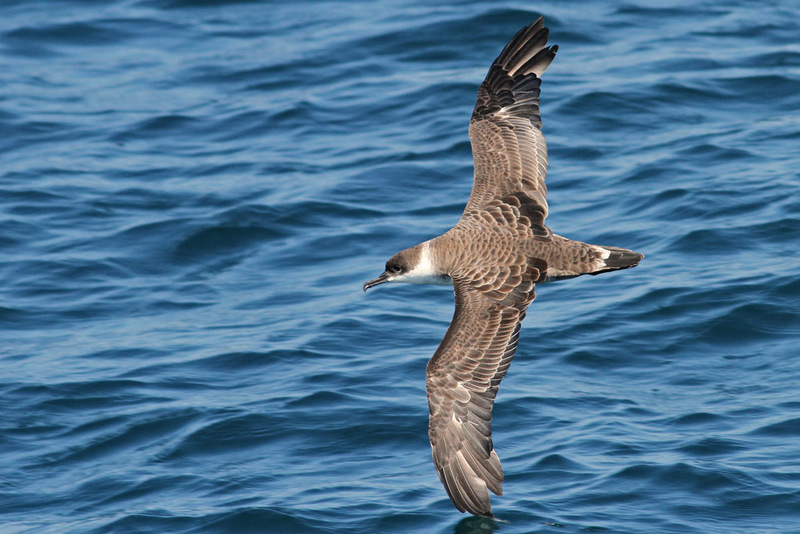 The ride back between the canyons and the Nantucket Shoals was predictably quiet, but the Shoals again produced jaegers for us. 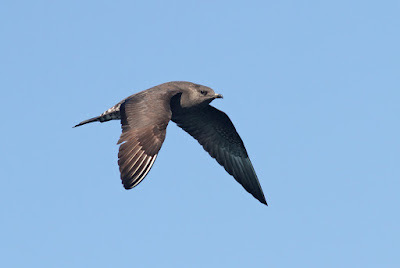 A couple more immature LONG-TAILS stole the show, and we had more encounters with the same four cool-water shearwaters that we had seen the previous morning. We disembarked the Helen H a very happy group on Sunday afternoon. This annual August overnighter always seems to deliver something spectacular. If you're interested in getting out there later this season, you have not yet missed the boat - this same exact trip is being run on September 24-25. 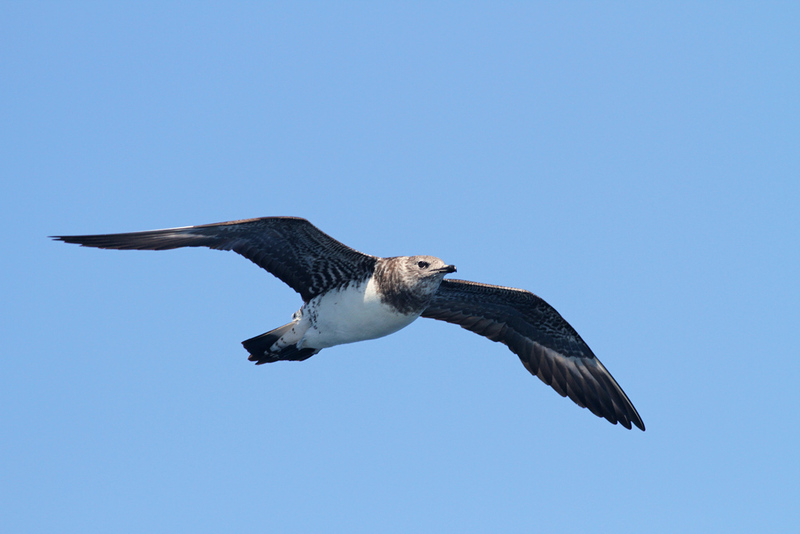 Check out the Brookline Bird Club web page for details and sign-up instructions. Also, for the fishermen reading this, I would be remiss not to plug the Helen H for its fishing prowess. 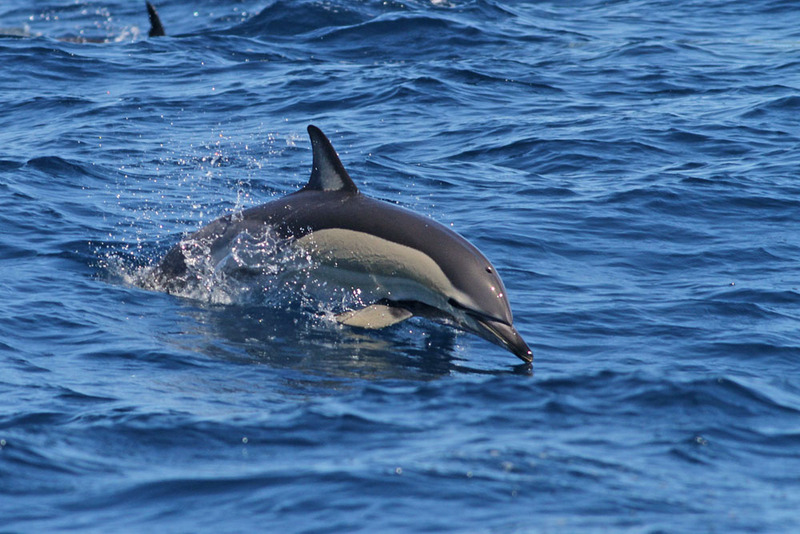 This boat is known for killer Fluke fishing (many people catch their personal best fluke from this boat), and offers fantastic access to the canyons for tuna (Yellow-fin) fishing from late August into October. If you're looking to fish these waters, there's no one better than the Helen H to put you on the fish.